Since then the investigation of the existence of Davao Death Squad him as Mayor in Davao City and now as the President of the Philippines, he took revenge against my staunched criticism and he used trolls in Facebook and other outlets, the fake news smeared to damage my name. 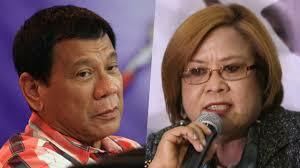 He holds grudge against me since I was CHR commissioner, Senator Leila De Lima lambasted President Rodrigo Duterte. De Lime stressed out that the fake news now spreading over the social media is being shared by pro-Duterte pages and websites. “To hear him recall the investigation, it is clear that he has not forgiven me, a woman, for my temerity to investigate his alleged involvement in the Death Squad,” she added. “The lady Senator was arrested and incarcerated because of serious drug charges where she was accused of allowing the illegal drug trade to proliferate inside the New Bilibid Prison when she was the DOJ Secretary,” Roque said.